Figure set includes Ant-Man and an ant he can ride! Derived from the Marvel film Ant-Man and The Wasp. Comes with interchangeable hands and a translucent plastic helmet. From the 2018 Marvel film Ant-Man and The Wasp, comes Ant-Man with a big ant he can ride! 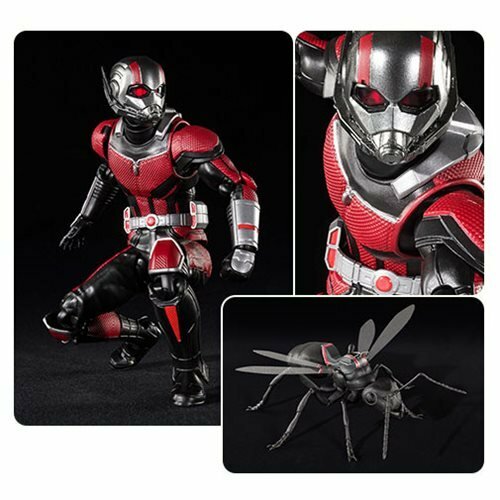 The Ant-Man and The Wasp Ant-Man and Ant Set SH Figuarts Action Figure P-Bandai Tamashii Exclusive includes interchangeable hand parts and a pedestal. Replicated in fine detail, the helmet features translucent plastic and precise paint applications for added realism. Ant-Man stands about 5 9/10-inches tall, and the ant measures approximately 9 4/5-inches long.